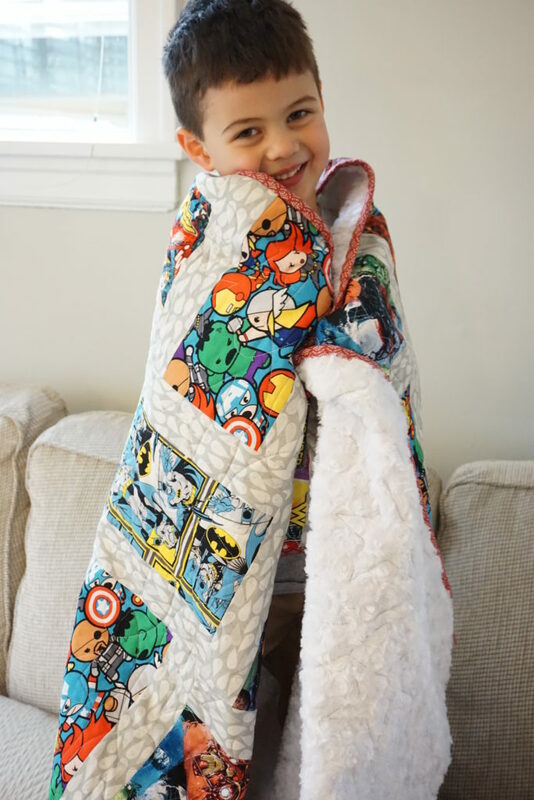 So I bought the most snuggly fabric I could find for the backing. This is rose marble cuddle fabric by Shannon Fabrics. I found it at my local fabric shop, Pacific Fabrics. 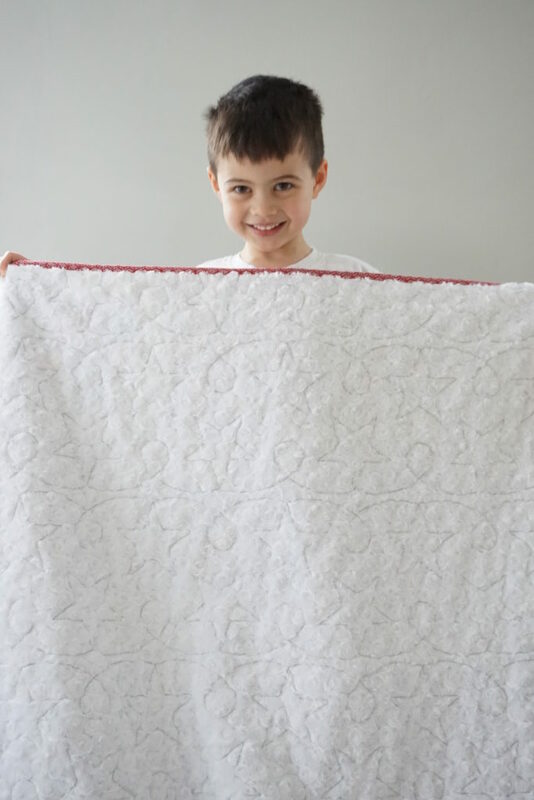 It’s great because it’s 60″ wide, so I didn’t even need to assemble the backing. 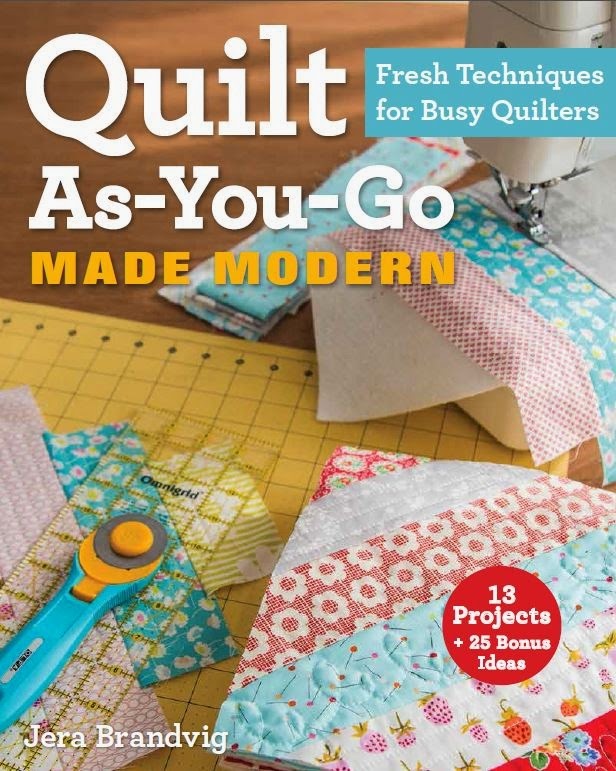 And here’s my quilting secret: My friend Monica Skov has long arm services, and YES! 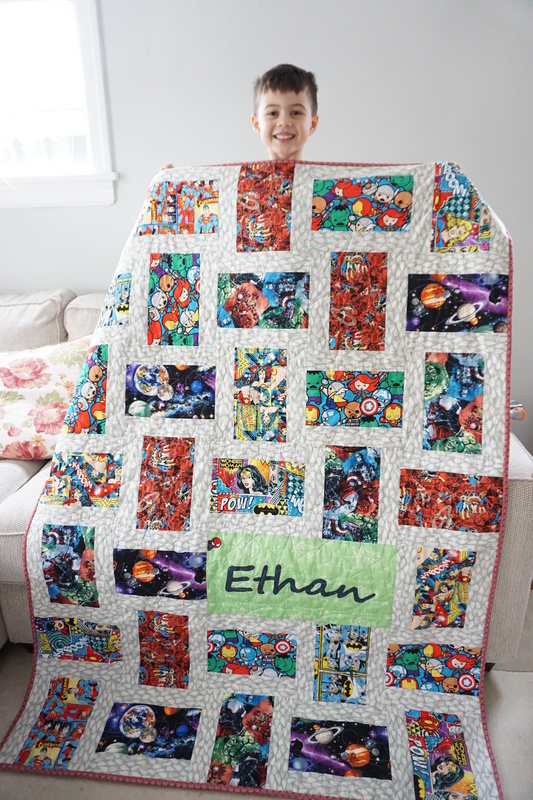 she quilts fuzzy backing!!!! 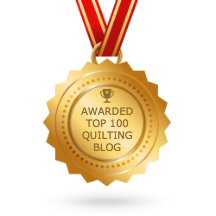 Monica is located in Seattle, but you can ship quilts to her as well. 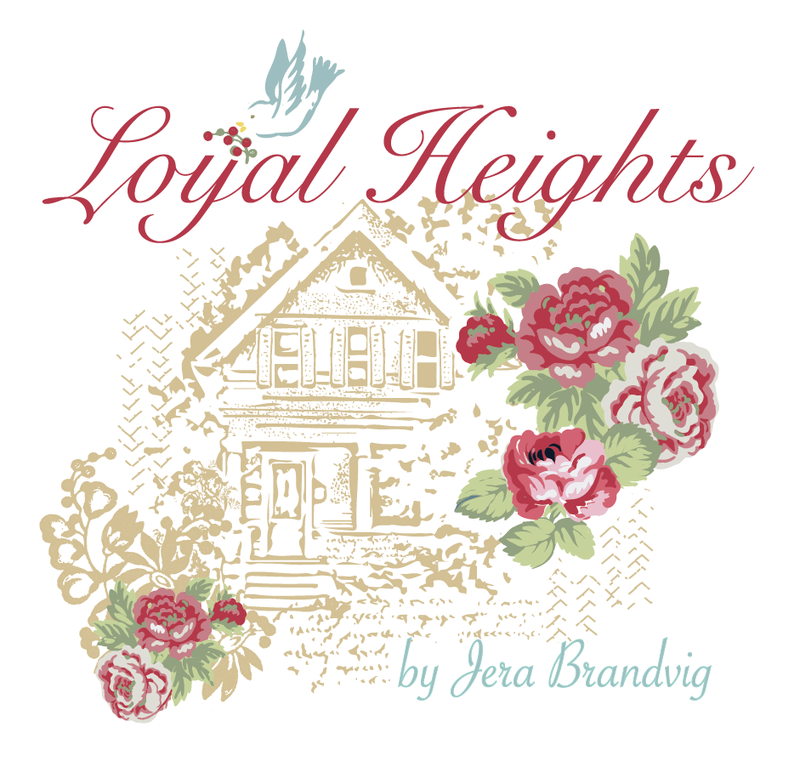 Details at her website over at It’s Just Sewing. 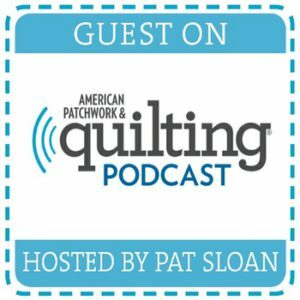 I’ve had 4 or 5 quilts finished by her already, and totally recommend her long arm services! 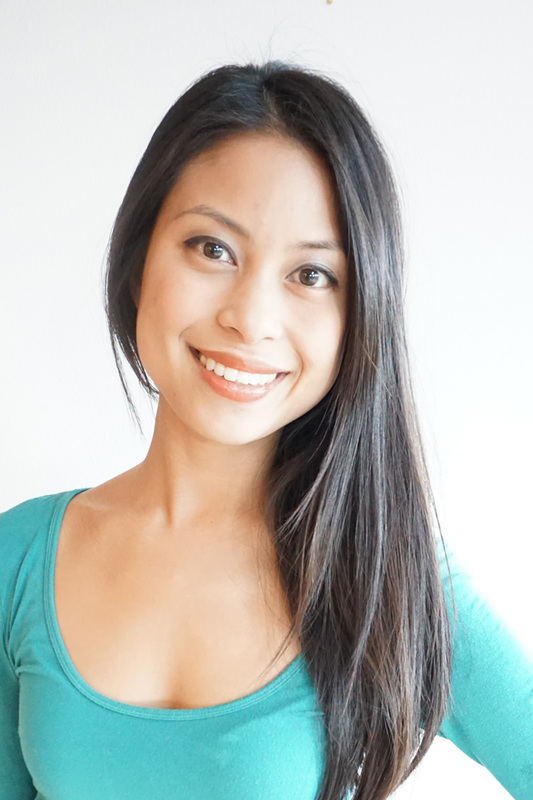 She has a quick turnaround time too! 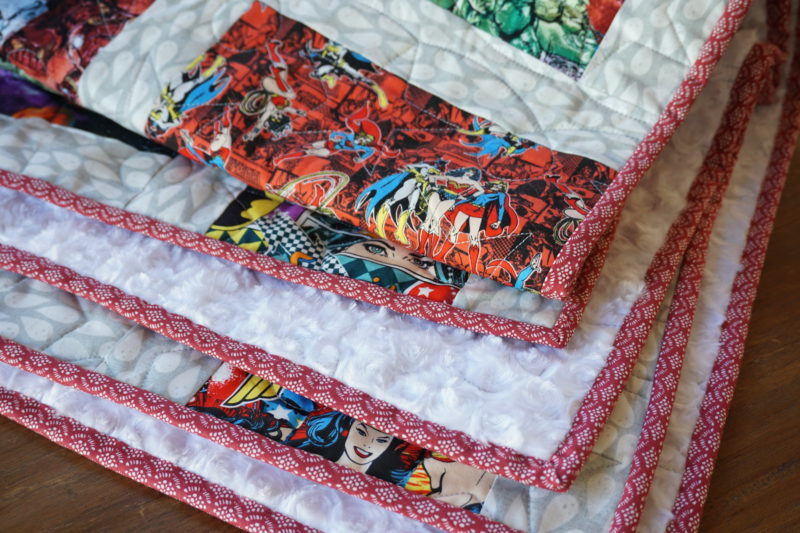 I used my Rainy Days quilt tutorial, which can be found HERE. 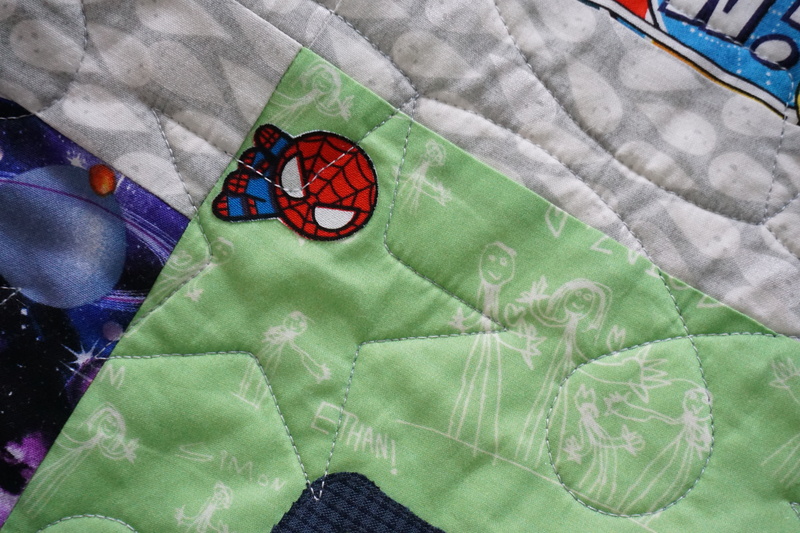 I chose this pattern because it showcases all the details of the superhero fabric so well. And it also comes together very quickly! For the name block, I replaced two 10″ blocks with one 19.5″x10″ rectangle. For his name, I chose a font I liked in Word and typed out his name, enlarged it, and then printed it. 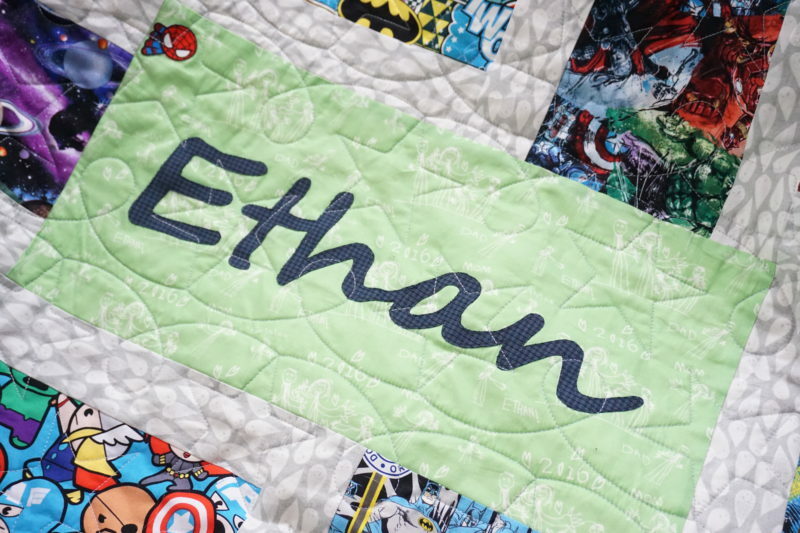 Then I used Steam-a-Seam fusible webbing (by Warm Company) with navy blue fabric, and traced his name onto it and cut it out. It’s very easy…just follow the directions on the back of the Steam-a-Seam package. Lastly, I simply ironed his name onto the rectangle. I did a top stitch around the edges of the name, though it probably wasn’t necessary as Steam-a-Seam sticks forever. 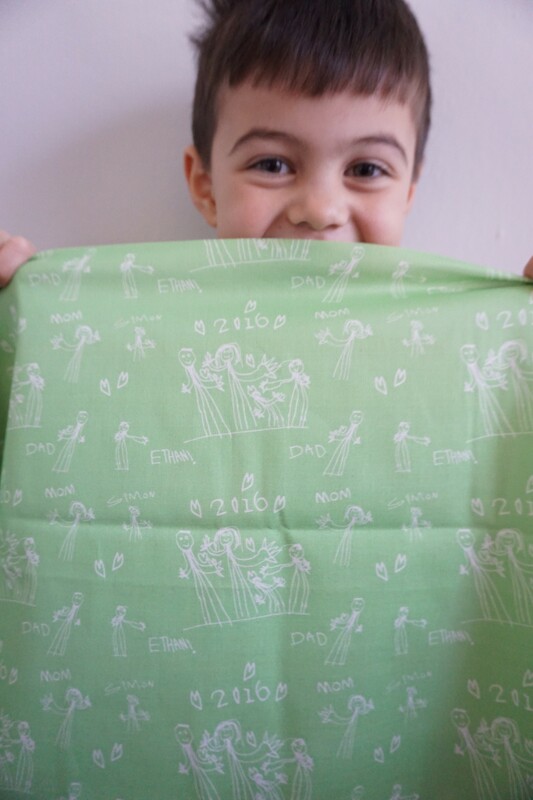 This green fabric is very special because if you look closely, it has Ethan’s drawings of our family on it. 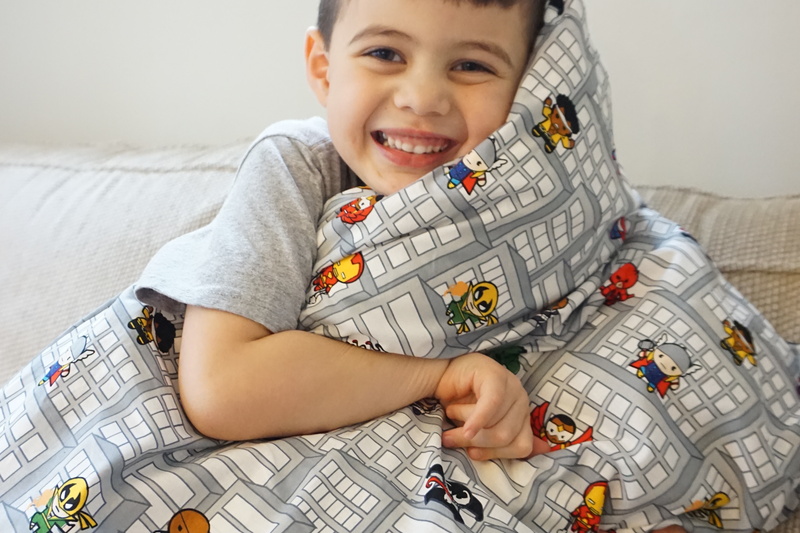 He designed this fabric and then I had it printed on textile via Spoonflower. 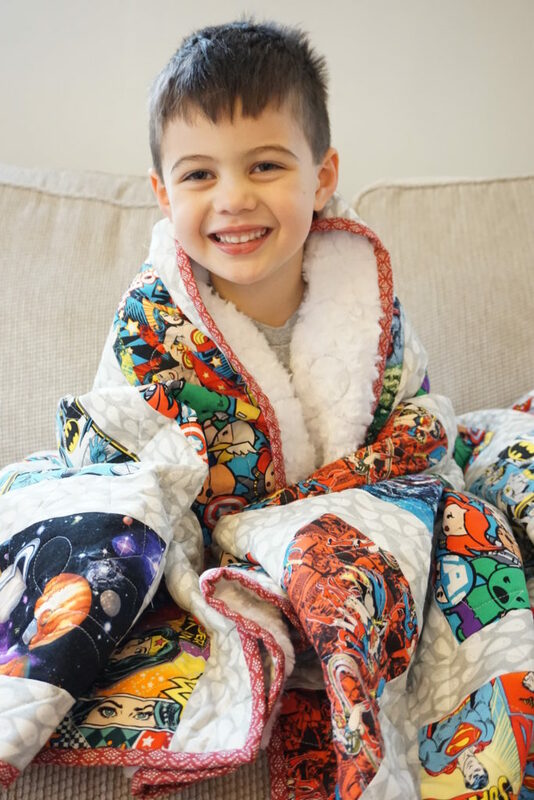 He was so proud to see his own designs on fabric, and it was a fun project we did together. 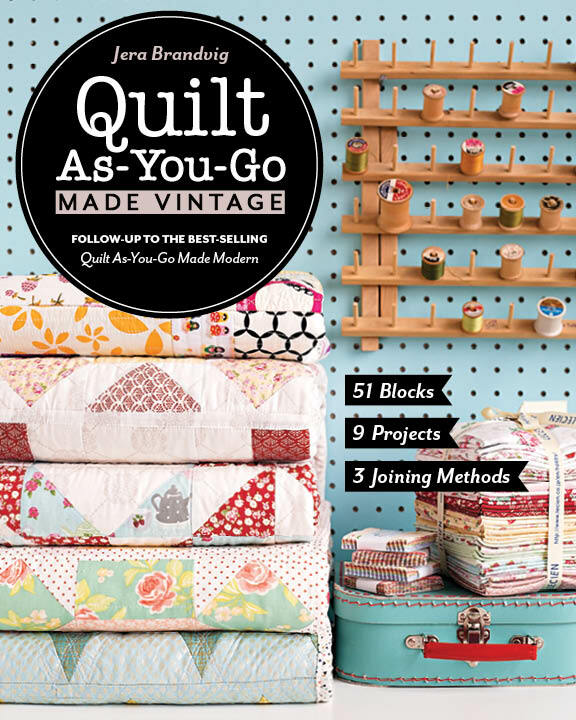 I bought all fabrics for the quilt top from Jean Marie’s Fabrics etsy shop. She shipped everything very quickly! 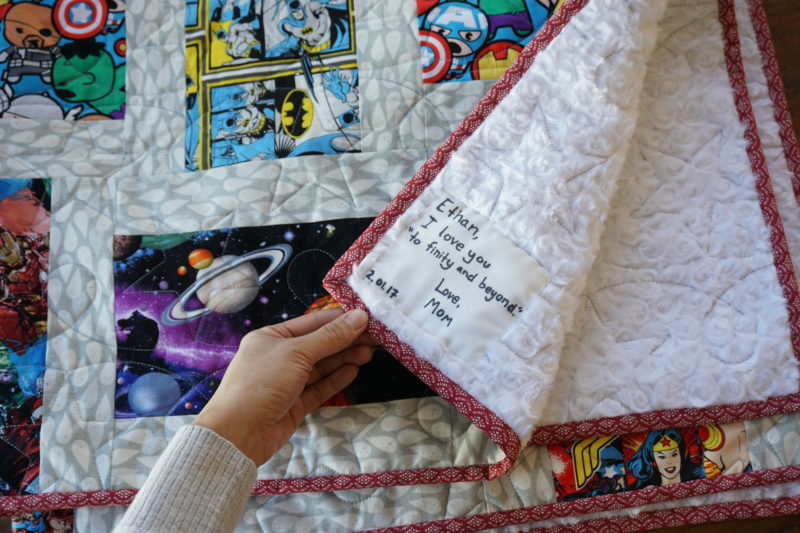 I don’t usually do quilt labels, but I did for this one. I just used a 5″ square and wrote on it using a Sharpie permanent marker. Then did a blind stitch to attach. 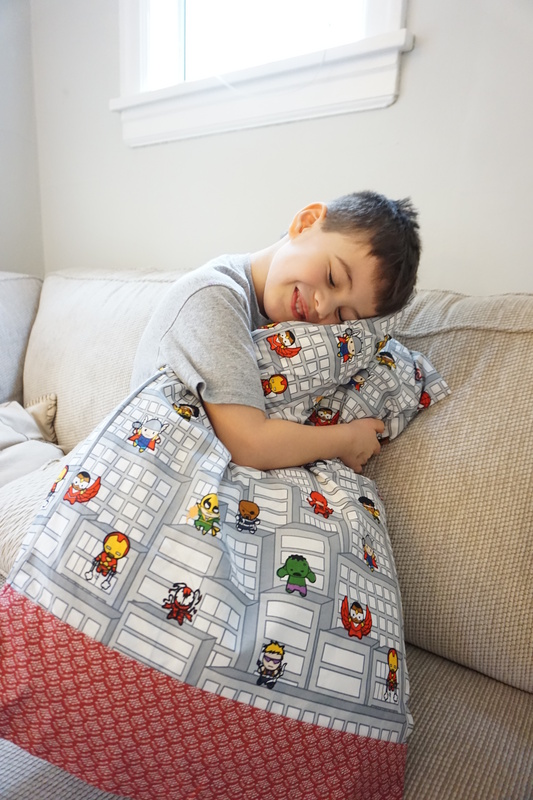 I also made him a matching superhero pillow case using my friend Monica’s Perfect Pillowcase video tutorial. It was very easy and quick. 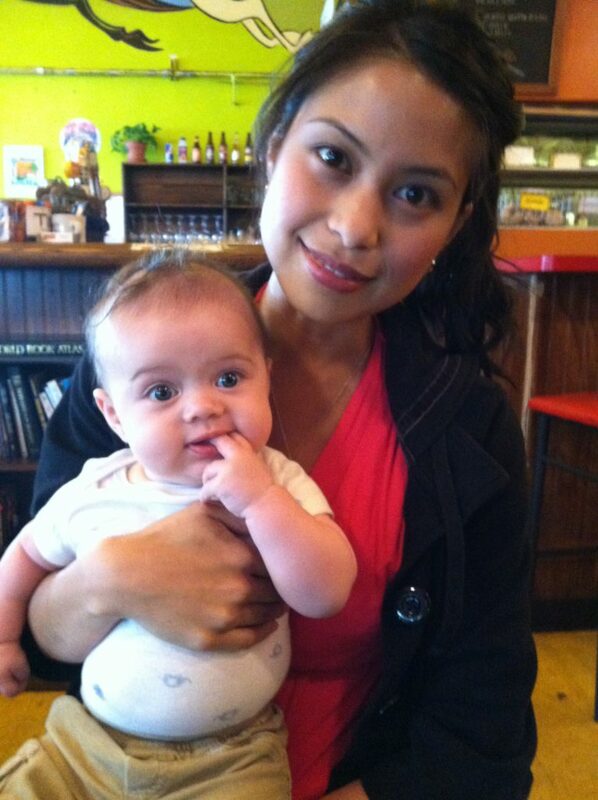 Not to say I have baby fever, because I still have his 18 month tasmanian devil of a brother, lol. 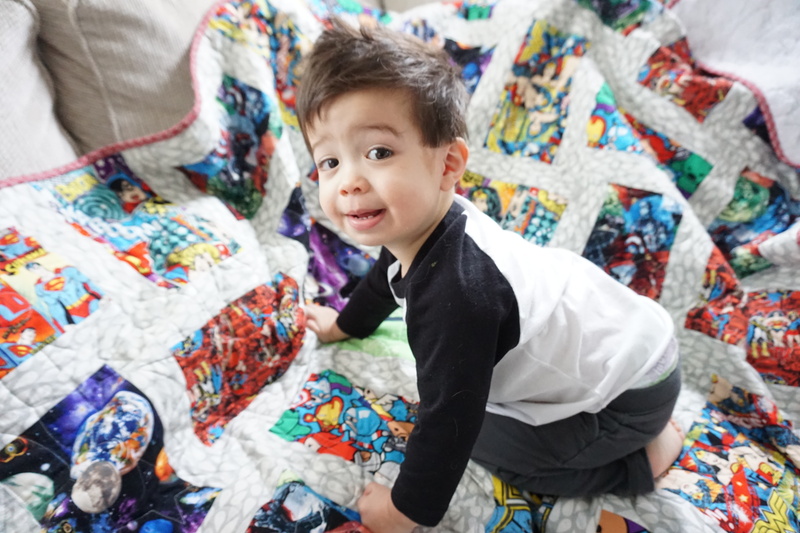 He loves the superhero quilt too! Anyway, I hope you enjoyed this post! Hope you’re all staying warm this winter!